The New York State Council of the Arts has generously awarded Thicket & Thistle our first major grant of $4,000. T&T will use the funds to mount a production of our newest show "Death Cruise", an offbeat musical comedy that follows a ragtag band of employees on an arctic cruise ship as they are tested and tormented by a demon. With this grant, we are one step closer to bringing our ambitious musical to the stage in NYC. "What's Your Wish?" Cast Album Released! The rumors are true... "What's Your Wish?" cast album is now online! Join our "wildly talented" (-Theatremania) cast of actor-musicians on an unforgettable adventure into a magic storybook. These catchy, folky tunes, recorded at Douglass Recording in Brooklyn, will transport you to a world of fantasy and humor. Available at iTunes, Amazon, Spotify, wherever you stream your music! What's Your Wish? received four nominations from The New York Musical Festival! We had an amazing run of What's Your Wish? at the New York Musical Festival! Thank you to everyone who came out to see "one of the liveliest, funniest shows of the festival!" Kyle Acheson is a composer, lyricist and actor from Cincinnati, OH. He scored his first film in his neighbor’s front yard, playing a Casio keyboard riff for an action scene captured on a shoulder-mounted VHS camcorder. He graduated from the Webster Conservatory of Theatre Arts in 2012 with a BFA in acting. He then set off on a great adventure that would take him across America and back again. In Portland, OR, Kyle wrote the musical The Waterman: a Forgotten Cascadian Myth with Sam De Roest and recorded his first album, Sun River. Kyle & Sam then packed their lives into a Kia Rio and drove across the country to New York, where they co-founded Thicket & Thistle in 2014. Sam De Roest is a Brooklyn based actor, improviser and playwright/composer. He is a graduate of Portland Actors Conservatory and the Curious Comedy Training Center in Portland, OR. In 2014, Sam and his writing partner Kyle Acheson (The Waterman) moved from Portland to New York City to pursue their interests in Musical Theatre. His recent writing credits include Thicket and Thistle’s What's Your Wish?, Cruisical! The Murder Mystery Musical, and The Waterman: A Forgotten Cascadian Myth, which received it's NYC premiere at Ars Nova's All New Talent Festival in June 2016. Since moving to New York City, De Roest won the award for “Best Actor” at Theatre Now New York’s Sound Bites 10-Minute Musical Festival, Featured in the award winning ensemble of the film, TRYST, and has performed at the Del Close Marathon with various improv teams. Sam is a founding member of the actor-musician ensemble Thicket & Thistle, where he plays mandolin and is Head Book Writer. He lives in Brooklyn but Sam is always #RCTID, Go Timbers. A resident of NYC from 2011-2016, Corley originally hails from Austin, TX. Corley began singing, acting, and songwriting at a young age. She made her onstage solo debut at the age of seven at the Gladewater Opry, where she delighted the audience with Reba McEntire’s “Walk On,” which she sang while nervously shifting her weight from one foot to the other. Somewhere in her mom's garage, there is filmed documentation of this occurrence. Since then, Corley has accrued many onstage hours both in theatre and music performance. She is a graduate of the Webster Conservatory of Theatre Arts, where she earned a BFA in musical theatre and also explored studies in directing, dialects, and songwriting. She has two albums of original music: a gypsy-bluegrass-soul amalgamation entitled Underworld, and a stripped down piano-and-vocals compilation called Simple Songs. 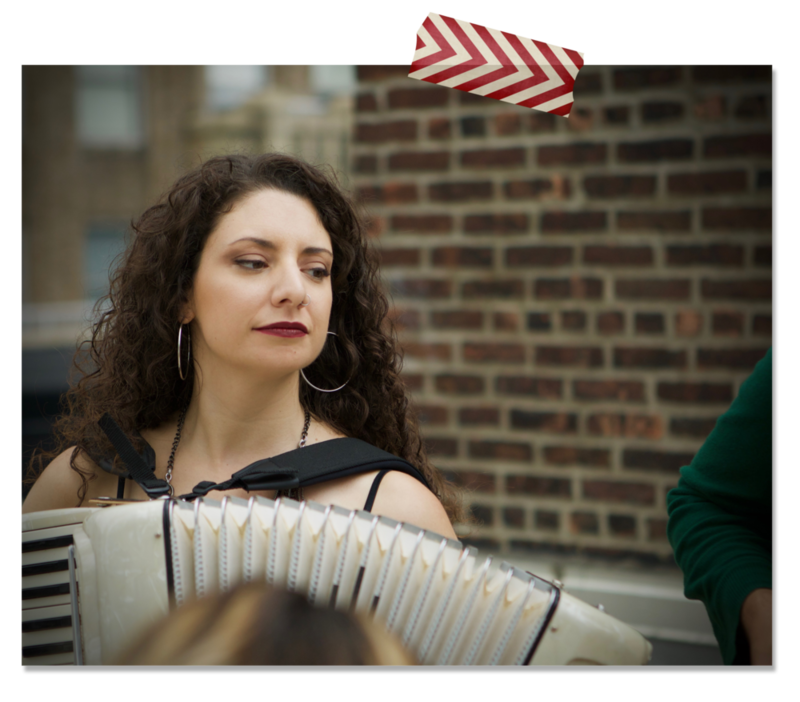 She plays the piano, accordion, and autoharp passably well, and enjoys singing in French. Being a bit of an artistic dilettante, Corley was also proud to serve as Thicket & Thistle’s unofficial Craft Captain until her NYC departure in 2016. Jonathan is a writer, actor, director, and producer in New York City. He grew up in Houston Texas, where he cultivated his passion for theatre. At 19, he was the youngest director to direct a mainstage musical with Houston Family Arts Center (Big River, 2009). Jonathan received his BFA in musical theatre from Webster Conservatory in St. Louis. While in St. Louis, Jonathan worked with multiple theatres on new and exciting works; most notably, originating the lead role in FALLING which made its Off-Broadway premiere in the fall of 2012. Since moving to New York City, Jonathan has been a member of The Flea Theatre and The Drilling Company Theatre, performing in their Shakespeare in the Parking Lot Series and Bryant Park Shakespeare Series. Most of Jonathan’s NYC career has focused on new works, his favorite projects being Broken Moments- an immersive bar musical, Walk- a song cycle by Ben Harrel, and TRYST- which played at the Manhattan Film Festival and the Brooklyn Film Festival, and is now available on Amazon. Of all the many wonderful days Jon has had in the Big Apple, his most impactful day was in February of 2014 meeting with Kyle Acheson and Sam De Roest to create a ten minute musical that led to the creation of Thicket & Thistle- a troupe of actor-musicians dedicated to creating inspiring theatre for the adult child in all of us. Jonathan directed Thicket & Thistle’s first musical What’s Your Wish?, from its inception as a ten minute musical for Sound Bites with Theatre Now New York, which has blossomed into a fully realized musical, playing at the New York Fringe Fest, the Chekov Festival, Access Theatre, The West End Theatre, and now The New York Musical Festival! Originally from Geneva, NY, Lindsay graduated with a BFA in musical theatre from SUNY Fredonia. Since graduation, she has done several TYA national tours, worked regionally, and even spent a summer in Switzerland teaching middle school children to sing in English! One favorite job was working at the Astors' Beechwood Mansion giving living history tours, performing in murder mysteries and Victorian balls, and brushing up her classical repertoire as the resident pianist. An avid dog lover, Lindsay spent several years working in a dog daycare, honing her skills at commanding a pack and howling at fire trucks. She lives with her own dog, Tucker, who is basically the cutest and best dog there ever was. Born in North Dakota, Joshua fled the Midwest years ago to escape the cold and wagon trains. He is an NYC-based actor, aspiring good samaritan, and an especially gifted napper. Joshua is a graduate of Minnesota State University in Moorhead, The UCB Theater in NY, and The Curious Comedy Training Center in Portland, OR. He has worked in many regional theaters, on television, web, and in film. NY credits include Allegro, Scarlet, and Zombie Strippers. Regional credits include Emmett in Legally Blonde, Frog in A Year with Frog and Toad (9 Drammy Nominations), Cliff in Cabaret, Bob in White Christmas, Mr. Pinkerton in Pinkalicious, Austin in I Love You Because and Eddie in Ripper the Musical. He continues to study performance and improvisation. If he could meet one actor living or dead it would be Danny Kaye. Go Sounders. Juliana Wheeler is an actress, singer, writer, and musician from Ashland, OR. A graduate of Portland Actors Conservatory, she recently moved to NYC to join Thicket & Thistle. Since graduating, she has performed in musicals, Shakespeare, sketch comedy, and more. Before moving to New York, she spent two years teaching music to children ages 6-14 at the Siskiyou School in Ashland, and continued her quest to learn all the instruments, her roster now including guitar, ukulele, banjo, mandolin and accordion, with dabbling in bass, piano and percussion. Her most recent acting recent credits include Ashleigh in Oh F*ck! Oh Sh*t! Its Love! The Musical, Juliette in T&T’s Cruisical!, and last summer, she spent a month at the Edinburgh Fringe Festival, playing the titular character in The Alien Chicken Remembers Galatea. Juliana is so happy to be in New York working with Thicket & Thistle, writing and performing work she believes in with her best friends. She most recently played the Enchantress in T&T’s NYMF run of What’s Your Wish? and is excited to continue writing and creating with these beautiful, silly, obscenely talented humans in the greatest city in the world. In February of 2014, Kyle Acheson, Sam De Roest, and Jonathan Foster met at a bar on 46th street and Broadway - the heart of the NYC theatre district - to discuss creating a new brand of musical theatre: actors collaborating with one another to create musical stories with verve, wit, and a dash of theatre magic, all while playing the instruments themselves. Soon after, they brought on Corley Pillsbury, and the group immediately began working on What’s Your Wish?, gathering in apartments to brainstorm, write, and laugh late into the night. We have grown over the course of 3 years into a 7-member ensemble of artists who all share in every aspect and responsibility of the creative process – from writing the book and music, to directing and performing in the show, to crafting the props and puppets, to handling the administrative duties of a theatre company. As a group, we have written and designed 2 original shows, What's Your Wish? and Cruisical! The Murder Mystery Musical. Each project has a peculiar life of its own, and we try to honor that through a deeply immersive writing process. By working and re-working the script and songs, we investigate the boundaries and intricacies of our shows at each stage of development, whether a rehearsal, staged reading or full performance. Close and honest collaboration provides the insights we need to make the best show possible. Our multidisciplinary storytelling fuses the traditional mediums of theatre and music in nontraditional ways to create original performance pieces. We are in love with the sense of play that we all inhabit so easily as children, but sometimes forget to access as adults. We built Thicket & Thistle on the idea that theatre is a place of shared imagination. We want everyone to feel that sense of play and excitement – we want to be magical permission-givers, reminding the inner child in all of us that it is not foolish, but truly necessary, to greet the world with a sense of wonder.